If you’ve learnt about bifold doors previously, you’re likely to already be aware of their ability to create beautifully lit rooms that feel incredibly spacious. What you might be unaware of, however, is just how secure they are. So to ensure you’re informed on this area too, we’ve created this short but informative blog. 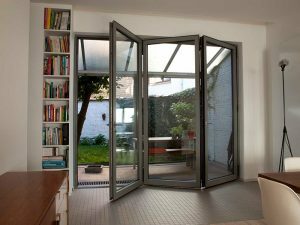 Generally, bifold doors are fitted with multi-point locks. Multi-point locks secure the doors at multiple points in the frame. This ensures potential intruders are not presented with an area of weakness that they can exert pressure upon to force open the doors. Additionally, a hidden, inline tracking system is in place, which should make lifting the bifold door out of the frame virtually impossible. Patio doors that aren’t fitted with an anti-lift device have fallen victim to this procedure in the past. The bifolds will be attached to a concealed gear in the bottom of the inline track. Anyone looking to remove the door will need to remove this too and unless they’ve got some heavy tools to hand, this isn’t possible. Secured by Design is a scheme run by the UK Police. Its purpose is to recognise products that are proven to reduce the risk of crime. If a set of bi-folds are accredited by this scheme, this indicates that they are most certainly secure. Can the glass in bi-folding doors be smashed? 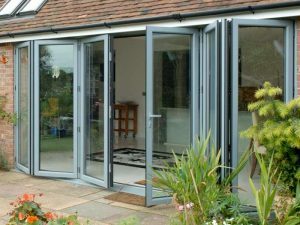 The make-up of bifold doors is predominately glass, which you might be thinking an intruder could easily smash before sauntering his or her way inside. However, the glass on bi-folding doors can only be smashed with excessive force. If the doors are double glazed, forcing entry this way will be even harder. Many intruders tend to rely on stealth when attempting to enter homes, although remaining covert will be very difficult when smashing the glass. Therefore, they’re unlikely to resort to this method. Also, the glass panels will be internally beaded. In the past, intruders have removed external beading on windows in order to gain entry. However, entry can no longer be acquired this way because internal beading is unable to be removed from the outside. Here at Emerald Windows, we install uPVC bi-folding doors that are tailor-made to your home. They’ve been fitted with all the aforementioned security hardware, including multi-point locks and internal glazing. But thanks to their thermally efficient uPVC profiles, they’ll keep the heat inside your home and potential intruders out. Therefore, you’ll be able to relax inside your home in total comfort and with complete peace of mind. Alternatively, we also supply aluminium bifold doors. Their profiles have been thermally broken so the temperature in your home will be pleasant all year round. Plus, they are Secured by Design, for proof that they’re up to the task of securing your home. We can tailor their size to your home, plus you can choose from a variety of colours and configurations so they’re the perfect fit. For more information on Emerald’s bi-folding doors or any of our other products, give us a call on 0800 612 4154 or contact us online.